The Millennium range of sliding wardrobe doors are great to use in rooms where you want to give the room a larger sense of space. Also, the rooms can be made to seem lighter with a full-length mirror or use light coloured glass. The glass bounces the light around the room to make them seem larger. At Superglide Wardrobes, we manufacture all our doors made to measure from our Cotswold based work shop and showroom. 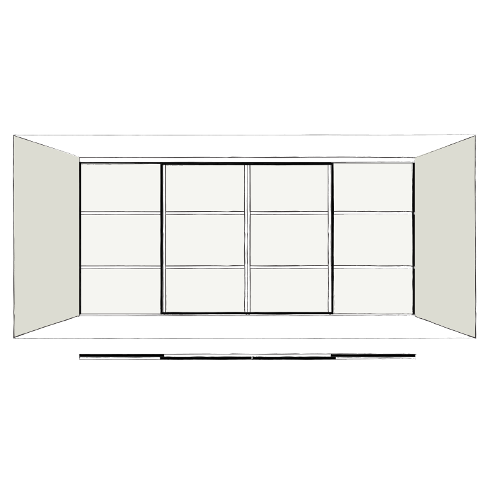 We use our own courier service to deliver all our sliding wardrobe doors FREE of charge throughout the UK. With over 30 years experience of manufacturing made to measure sliding wardrobe doors, interior and bedroom furniture, if you don’t see what you want please just contact us as we can make all our products to suit your individual requirements. This system runs with weight on to the floor, so sliding wardrobe door is NOT suspended from the ceiling. The doors have an anti-jump device system which fixes into the bottom tack. The top of the doors has two wheels which run side by side and expand side ways into the top track to guide the doors to run smooth and quiet.